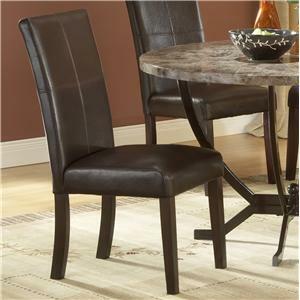 The Parsons Chair is wrapped in a chic brown leather with attractive stitched accents, creating a modern look for the dining room. 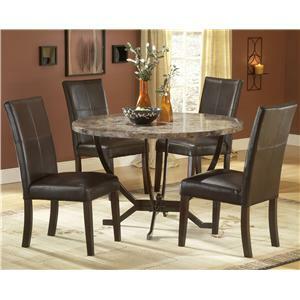 Simple legs and a long seat back make this dining chair a most comfortable place to sit for meals and family game night. This affordable side chair is perfect for a dining room or kitchen in need of comfortable, understated, stylish furniture. The Monaco Upholstered Side Parson Dining Chair by Hillsdale is available in the area from FMG - Local Home Furnishing. The Monaco Collection offers luxury and elegance at a price you can afford. 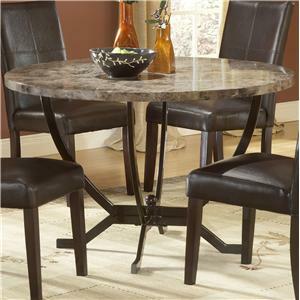 A dynamic faux marble table top sits atop a dramatic and strong metal globed base. The sumptuous parson's chair subtly compliments the rich colors in the table top. Comfortable and understated, the upholstered parson's chair is covered in a rich brown leather with attractive stitched accents. Constructed of wood composites, marble veneers, solid wood, and leather, the Monaco Collection is a fantastic addition to any kitchen or dining room. Browse other items in the Monaco collection from FMG - Local Home Furnishing in the area.